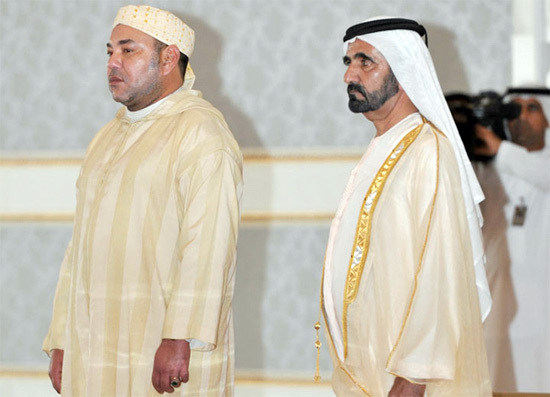 Mohammed VI Gulf Tour: An Arab Union in the Making? Moroccan King Mohammed VI wrapped his eight-day tour of the Gulf Arab countries that took the sovereign to Saudi Arabia, Qatar, the United Arab Emirates, Kuwait and Jordan. Overall, it is a combination of economic interests and broader geo-political considerations that accounts for much of the Moroccan diplomatic offensive. In the economic sphere, the Moroccan king’s visit of the Gulf Cooperation Council (GCC) states that officially aimed at discussing investment, economic co-operation and strengthening bilateral relations could be seen as part of a broader strategy aimed at diversifying economic partners. Accompanied by a delegation of ministers and advisors, King Mohammed VI presented projects to be funded by GCC grants. The GCC leaders agreed to give Morocco grants worth five billion dollars to be distributed to Morocco at the rate of one billion dollars per year over the period of 2012-2016. These contributions are part of the strategic partnership framework established in 2011 between Morocco and the Gulf Cooperation Council. In particular, the Moroccan monarch’s official working visit in the GCC countries has focused on three areas of partnership agreed between both sides – direct budget support for infrastructure and social projects, sovereign wealth fund investment and injections of private capital. Reportedly, among the possible areas of co-operation and investment discussed during the visit were also Moroccan government’s planned $1 billion-plus sovereign bond issue, partnerships between its state-run airline Royal Air Maroc and a major Gulf airline, and the sale of the 53 per cent controlling stake held by France’s Vivendi in Maroc Telecom, the country’s largest telecommunications operator. The king’s visit to the region was particularly designed to drum up the interest of Gulf institutional investors to buy a substantial amount of the sovereign bonds whereby the billions of dollars raised are intended to fund ambitious solar and wind energy projects, the telecommunications sector, as well as infrastructure, tourism and agricultural developments. Though largely escaping the revolts and unrest sweeping the Arab world, Morocco’s government has been under heavy domestic political pressure to improve living standards, provide jobs and come up with effective measures to eliminate poverty. This is also why attracting foreign investment is high on Moroccan government’s agenda – notably focusing on infrastructure investments designed to improve access to basic social services and strengthening the development of other sectors, such as agriculture. Being heavily exposed to the troubled euro zone, with tourism, migrant transfers and foreign investment being particularly hit hard, Morocco – the biggest recipient of European Union financial aid outside Europe – is all too keen to diversify its $90-billion economy by looking beyond its traditional trans-Mediterranean ties and take advantage of friendly relations and shared cultural ties with the Gulf Arab countries. Morocco and the Gulf states are interested in each other but it is clearly for different reasons – while the former is keen to tap into the oil riches of the younger Gulf monarchies, the latter look to King Mohammed for some inspiration, seeing him as a useful example of a leader adapting to regional political change by introducing limited democratic reforms. Even though poorer in economic terms, Morocco’s move towards a more open political system – a move initiated by King Mohammed who comes from the Arab world’s longest-serving dynasty – has gained a great deal of attention and respect and is being closely watched by the younger Gulf Arab monarchies. The recent mass opposition street protests in Kuwait and the still simmering tensions in Bahrain could serve as a reminder that the highly-controlling Gulf monarchies are far from immune from political and social unrest and upheaval. Hence, the Moroccan king’s visit demonstrates how the concerns over the spread of Arab Spring revolts and its implications have drawn together the region’s monarchs – a case in point is the Gulf monarchies’ invitation in 2011 of Morocco, along with Jordan, to join the Gulf Cooperation Council. As some monarchies in the Middle East are passing through a period of unprecedented turmoil and uncertainty about their own future, an informal ‘Kings’ Club’ – much like the League of the Three Emperors or Holy Alliance in the 19th century Europe – like that highlighted by the Moroccan king’s tour has symbolic force and makes political sense. The Moroccan monarch has long promoted the idea of an Arab Union, loosely drawing on the European experience. With the now largely defunct project of Arab Maghreb Union, Moroccan elites generally seem to envision a real partnership with GCC countries that would provide a new axis for political stability and economic prosperity. It then does not come as a surprise that the Moroccan press has recently highlighted the existing “psychological affinity” between Morocco and much of the Arab world. Much like Europe, the Arab world has a common religion and shares a set of traditions and values. Moreover, the Arab countries share – unlike Europe – one common language. King Mohammed’s tour seems to have sought to show – by a practical example – that by seeking cooperation with one another, Arab nations are capable of achieving common political and economic prosperity and peace – a complex process that could one day lead to the establishment of a common regional market and eventually an Arab Union. Dr. Daniel Novotny is the Director of the Global Europe think tank and Adjunct Research Associate at Monash University, Melbourne. In 2010, he published a book ‘Torn between America and China: Elite Perceptions and Indonesian Foreign Policy’. He has held fellowships and/or taught at the RSIS and the ISEAS (Singapore), University of New South Wales, Monash University, Deakin University, Australian National University (Australia) and Anglo-American University and Metropolitan University (Prague). He holds a PhD (2008) from the University of New South Wales, Sydney.